Abies concolor 'Wattezii Prostrate' is superficially similar to 'Violacea Prostrate'. It is a little slower, just as prostrate but with the new growth whitish to creamy yellow, fading to Blue-grey in the summer. If in time a leader appears, it should be removed to keep a low plant. Annual growth 4 inches (10 cm). 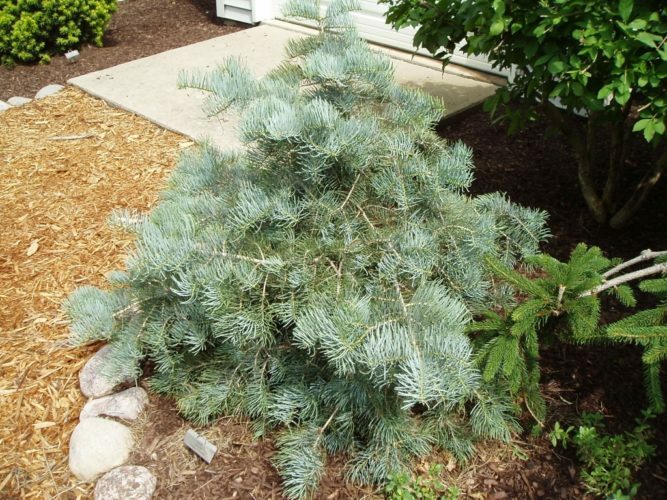 Like Abies concolor 'Wattezii', but grafted from a side branch and therefore low and wide growing. Abies concolor 'Watezii Prostrata' photographed at the Rathje garden in McCausland, IA, during the ACS 2008 National Meeting.